You know us always eager to review new board games! Shadows Amsterdam was a fantastic addition to our collection. I was delighted when Asmodee sent me a copy to review. It didn’t take us long to understand how to play. Setup wasn’t overly complicated either. Which is a good thing as my boys aren’t the most patient when your getting to grips with a new game. The idea of the game is to pair up as an investigator and detective team. The investigator tries to give clues to locations of evidence without speaking! They only have intel cards at their disposal. It reminded me a little of Codenames but with that you use one word, this game you use one or two cards depending on if you want your player to move one or two places. I love the detective figures! Everything is lovely quality. If they make a wrong move its not too much of a problem! Hopefully they won’t have landed on one of the police spaces as then you must give your team member a police token! If they get three of these the other team wins. You take more of a risk moving two spaces, I think. As you need to make sure the two cards you pick work well together! The clues really get you thinking. My husband found it easier being the investigator than I did. He was always first to pick the cards he wanted. My little cogs were still going in my brain debating which cards would work best! So, he had a distinct advantage! But the game still ended with a very narrow victory. Somehow youngest and I managed to catch up and we were both on three pieces of evidence and the sprint to the rendezvous point by the end. In the beginning my youngest who is nine just used guesswork, it was the luck of the draw if he landed on the right spot! But he slowly got the hang of the game and tried looking for clues. It’s hard at times because some of the evidence locations are available to both teams. It’s just a case of getting their first! Then it helps if you pick your intel cards quickest as you might have clearer clues in them. You can choose between the investigators to swap the 10 intel cards for others. But when I wanted to do this my husband was already happy with his two intel cards, so my request was denied! Fortunately, by some miracle my youngest managed to work it out! One of the people in the location was carrying a bag, so I went for an intel card that happened to show a character also carrying a bag! The cards are beautifully illustrated. I really liked finding an Efteling theme park card as that’s one place I would love to visit! 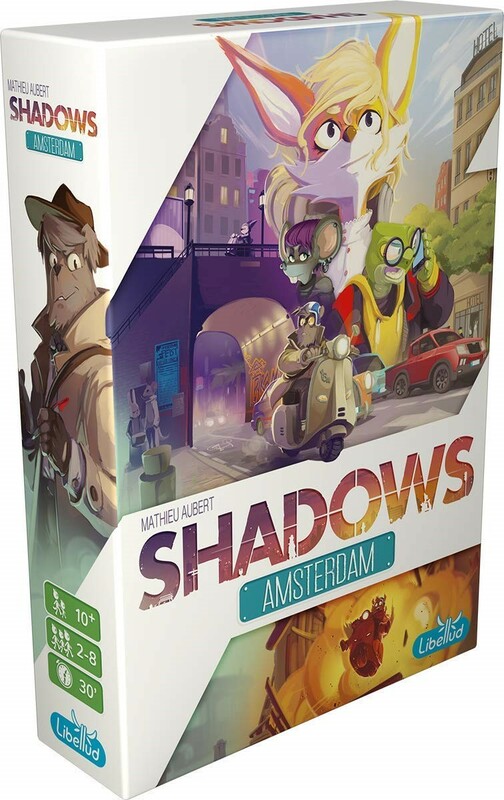 If you would like to win a copy of Shadows Amsterdam, please fill out the form below by the 8th of March. I also have lots of other lovely competitions live so please do enter them too! Fabulous addition for gaming family ?? ?